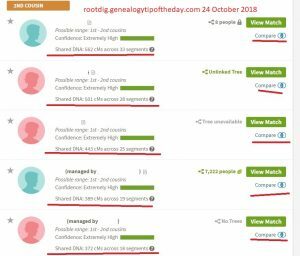 This was posted to Genealogy Tip of the Day a few weeks ago, but how it was discovered is worth a post as well. This list of ministers licensed to perform marriages in Coshocton County, Ohio, was located in an early marriage register. In browsing the front of the volume (while looking for the index that was actually created by the clerk as the marriages were recorded), there was a note on a separate page indicating that a list of ministers was on pages 151 and page 152. If I had only looked at the index pages or if I had only looked at the page for the “marriage of interest,” I would have missed this wonderful find. Sometimes the best finds are made by browsing and not running right to the page the index gives you. In some early records during this time period, a variety of things may be recorded where you might not expect to find them.